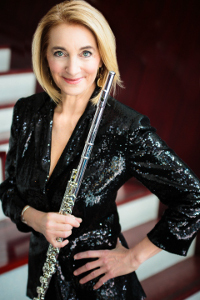 Grammy and recent National Flute Association Lifetime Achievement Award winner, flutist Carol Wincenc celebrated her 2010 Ruby Anniversary with rave reviews from the New York Times, Wall Street Journal, The New Yorker, and Performance Today. Beloved muse of today’s most prominent composers, she has premiered concerti written for her by Lukas Foss, Henryk Gorecki, Joan Tower, Paul Schoenfield, Jake Heggie, Peter Schickele, Roberto Sierra and Tobias Picker. A prolific recording artist, her performance of Pulitzer Prize winner Christopher Rouse’s Flute Concerto with the Houston Symphony on Telarc Records won her the coveted Diapason d’Or Award, and her recording with Maestro Jo Ann Falletta and the Buffalo Philharmonic on Naxos was Gramophone’s Pick of the Month. As winner of the sole Walter W. Naumburg Solo Flute Competition she recorded a disc of French music with pianist Andras Schiff on the Music Masters label, which was awarded the Recording of Special Merit. She has appeared as soloist with such luminary ensembles as the Chicago, St. Louis, San Francisco, Detroit, Pittsburgh, Atlanta, BBC, Warsaw, and London Symphonies, and the St. Paul, Mostly Mozart, Los Angeles, and English Chamber Orchestras. She has performed at music festivals in Aldeburgh, Budapest, Frankfurt, Santa Fe, Spoleto, Banff, Sarasota, Music@Menlo, Norfolk, Tivoli and Marlboro. A founding member of her Trio Les Amies with New York Philharmonic principals, harpist Nancy Allen and violist Cynthia Phelps, she is also a longtime member of the prestigious New York Woodwind Quintet. Her recording of the Mozart Flute Quartets on Deutsche Grammophon with the Emerson String Quartet is regarded as one of the definitive interpretations of these works. As a result of her fascination with the flute family, Wincenc created and directed a series of International Flute Festivals in St. Paul, Minnesota, featuring such diverse artists as Jean-Pierre Rampal, Herbie Mann, and Native American flutist R. Carlos Nakai. Lauren Keiser Music Publishing and Carl Fischer publish a series of Carol Wincenc Signature Editions, featuring her favorite flute repertoire. Ms. Wincenc continues her teaching legacy at Stony Brook University as well as her alma mater, The Juilliard School, graduating masterful students holding prominent careers worldwide as teachers, concerto soloists, and orchestral musicians.